Last year I spotted a quince tree, laden with fruit in a Bristol garden as I parked up my car. 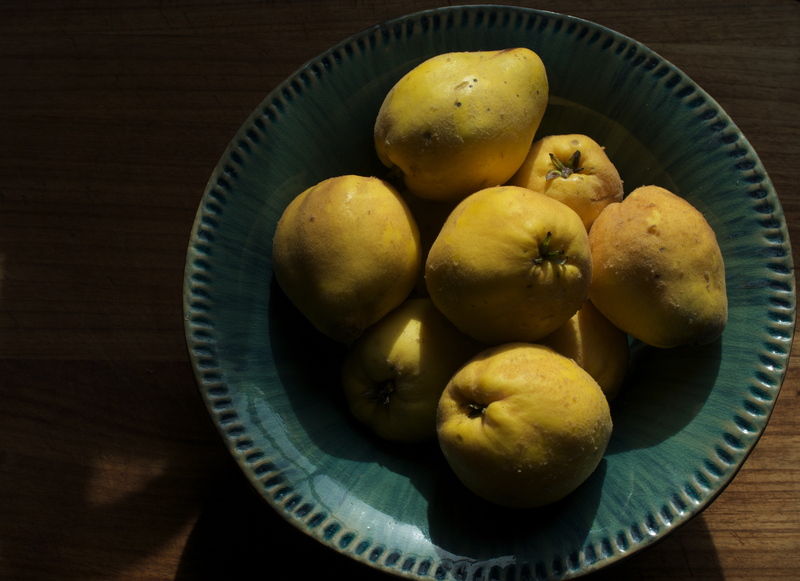 Quinces are mysterious things; they’re too hard and too sour to consider eating raw. You can’t even whip up a tart or a crumble as you might with an apple because the flesh takes so much longer to soften and mellow. So, many a forgotten quince languishes, unloved on a tree in this country until it rots and drops. 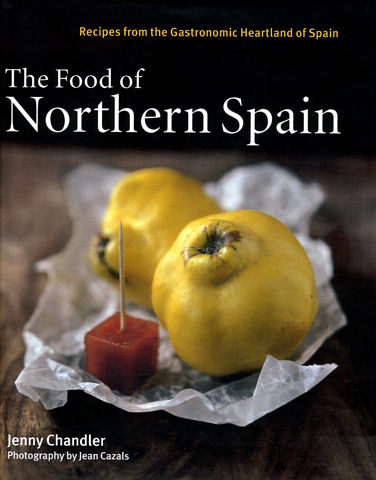 I posted a note through the door of the house where I’d eyed them up, offering some cash and even a good slice of membrillo, but never heard a thing. This year I got a message from some wonderful friends Mike and Viv in Bishopston who offered me a few of theirs. I jumped at the chance, grabbed my basket, slipped on my quince-yellow top (who can miss a photo opportunity?) and set off. Mike was ridiculously generous and I finished up with at least a dozen quinces. They’ve been sitting in a bowl filling the kitchen with their unforgettable perfume and looking so beautiful that I could barely bring myself to cook them. You can see why they are reputed to be the original golden love apple of Aphrodite. 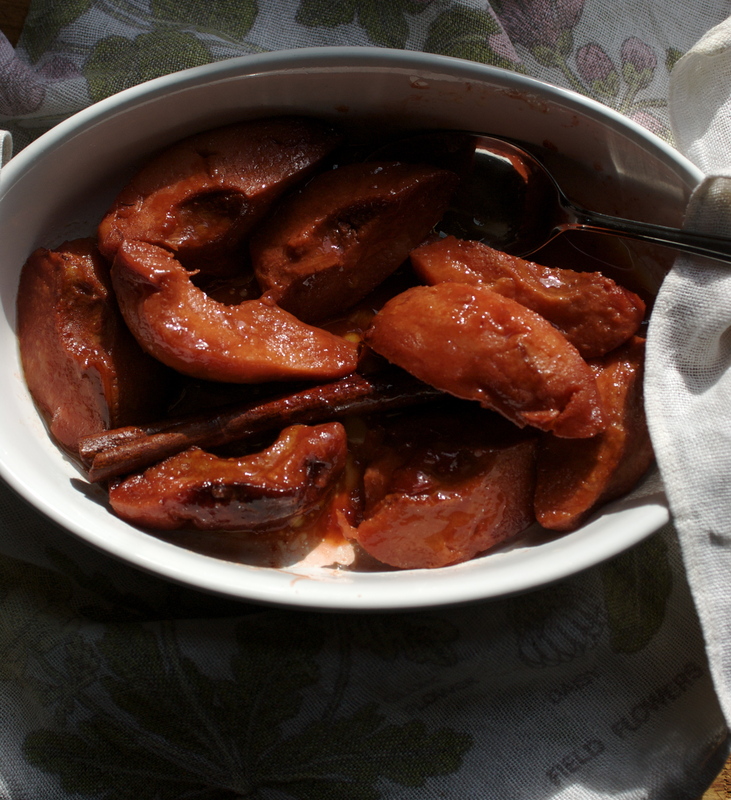 I’m going to make some membrillo (the solid quince paste that the Spanish love to eat with cheese – particularly Manchego) later in the week, but yesterday I baked a few of the fruit until deep coppery red and as tender as a canned pear. Now these really couldn’t be simpler. Pre-heat the oven to a medium temperature around about 170º C. Place a heatproof dish in the oven with the butter and sugar just to melt and dissolve a little. Meanwhile peel and quarter the quinces (unless they are very tiny and you might like to leave them in halves) I used my trusty melon-baller to remove the cores but you could just use a knife. Take the dish from the oven and roll the fruit around in the sugary butter. Add a stick of cinnamon and then cover tightly with foil. Put back in the oven for 2-3 hours until the fruit is really tender and a deep brick-red. It’s wise to take a peek at hourly intervals just to check that there’s a bit of moisture in the dish, your packaging may not be as steam-tight as you think. Just add a slosh of water (or wine/Masala) if it’s looking rather sticky and dry – you musn’t let those precious juices burn. I would always recommend baking a few quinces at a time and then using them in all sorts of different ways. Play around with the flavours adding any, but not all, of the following : vanilla, star anise, wine, port, Creme de cassis, honey or maple syrup. *Serve warm with clotted cream, Greek honey with yoghurt, vanilla ice cream or rice pudding. *Stir into a simple lamb tagine instead of apricots – I’ll type up my favourite recipe sometime but here’s one to keep you going from Jill Dupleix. Just add roasted rather than poached quinces. * Serve with a blue cheese and lentil salad as I did at The Great Bath Feast. Carefully stir about 2/3rd of your quince, blue cheese, walnuts, celery and watercress into the lentils. Be gentle you don’t want the cheese to collapse and make the entire salad look milky. Spoon onto individual plates or onto a large serving platter and sprinkle over the remaining ingredients. Place the lentils in a pan with the bay leaf and cover with cold water by about 5 cm/ 2 inches . Bring them up to the boil and then simmer for about 20-30 minutes until tender but still intact. Pour the vinegar over the red onion and leave to soak. The onion will turn fuschia pink and become softer in both texture and flavour. Drain the lentils, reserving their cooking liquid, and whilst still warm add the vinegar, olive oil and season well with salt and black pepper. Once cool stir in the chopped parsley and add a little cooking water if the salad seems dry. And -you can of course use this basic lentil salad as the base of dozens of variations eg beetroot and feta, chicken and avocado, Piquillo pepper and Montenebro goat’s cheese. 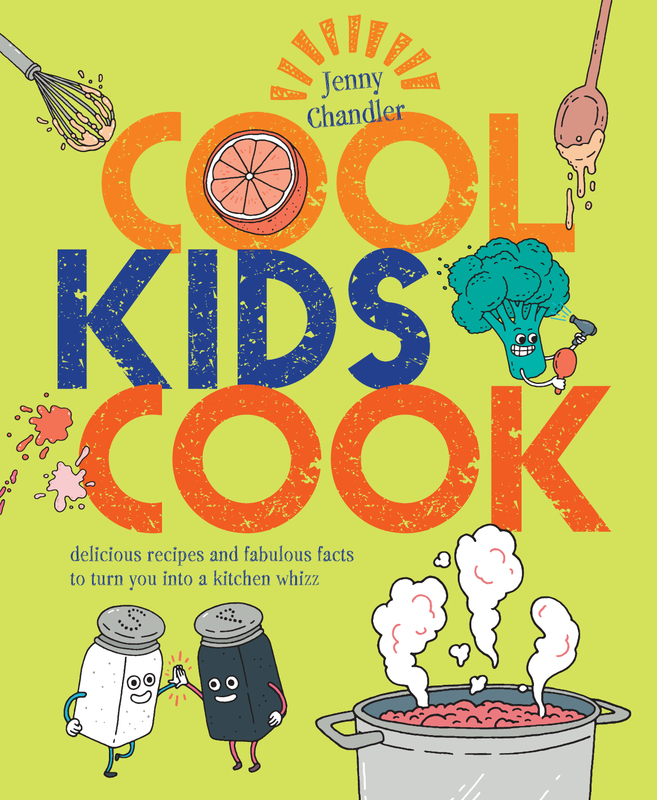 The best place to look for these ideas is without a doubt (you guessed it) my new book! 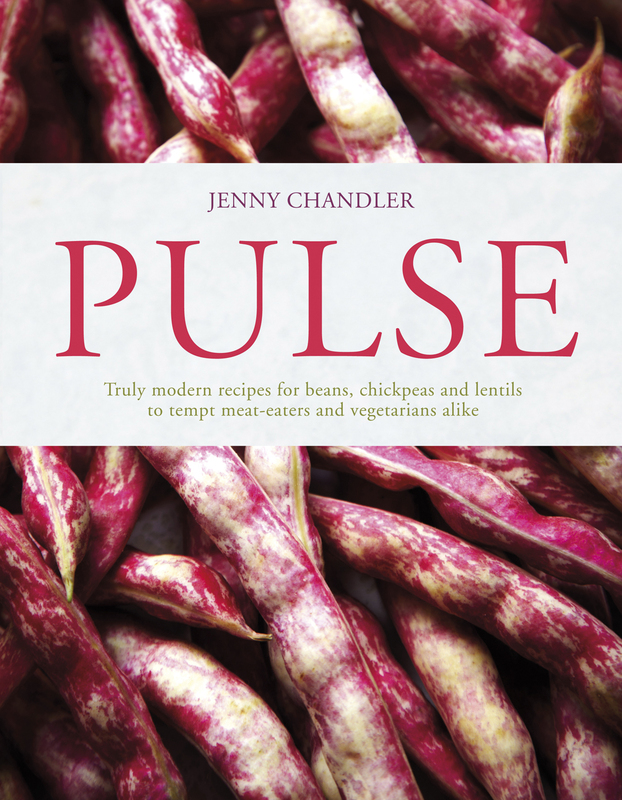 If you came to my demo on Sunday in the great Bath Feast Pavilion then you may be wondering about the chickpeas too. You can go to the fabulous Borough Market blog (I teach there too) and just add a bit of Orchard Pig cider to this recipe.